Almost 19 months after having seized the domains rojadirecta.com and rojadirecta.org, the U.S. Government has withdrawn its complaint against these domains and the Court has already ordered their return. On January 31, 2011 the U.S. government seized our domains rojadirecta.com and rojadirecta.org as part of its operation “Operation In Our Sites”. We immediately initiated talks with the government, through our legal representatives in San Francisco and New York, in order to obtain the return of the same. Since it is impossible at this stage to recover domains amicably, we filed a complaint against the Government, the Department of Homeland Security and the Immigration and Customs Enforcement agency of the United States of America. In response to our complaint and as a requirement to keep the seized domains, the Government proceeded to sue both domains, which it withdrew today more than a year later and which has led, almost instantly, the Court of the Southern District of New York to order the return of the domains. Shortly after learning of the court order, we started proceedings with the organizations responsible for all .com and .org domain registrations (Verisign and PIR respectively) in order to restore the domains. In the coming hours Rojadirecta will again be accessible from rojadirecta.com and rojadirecta.org, that is from the domains that never should have been censored. – Since 31-Aug-2012 16:49:15 UTC the rojadirecta.org domain points to the Rojadirecta site. – Finally since 05 Sep 2012 19:14:44 UTC the rojadirecta.com domain also points again to the Rojadirecta site. In the previous post we explained how Google eliminated millions of results from the domain rojadirecta.com, when Audiovisual Sport only specified the address http://www.rojadirecta.com as the address to be censored. We also explained how the http://www.rojadirecta.es page was eliminated a few days ago from Google’s search engine results, even though this was not what MLB had requested, since they had only made reference to the Adsense advertising program and not the search engine. However, we have now confirmed that Google, based upon that last request, has also filtered the pages forum.rojadirecta.es and blog.rojadirecta.es, although MLB only made reference to www.rojadirecta.es. (note that Google requires a one-by-one indication of the search results to be eliminated). At the time of this post’s writing, this blog has only two entries, and oddly enough, these reveal the errors made by Google and MLB. Therefore, Google is censoring the two links from Rojadirecta to our criticism of Google found on the web page and the blog homepage. It is worth pointing out that the blog does not contain links to broadcasts of sporting events of any kind, and what is worse, MLB did not even complain about blog.rojadirecta.es (as we mentioned in the previous paragraph). We believe that this is only a coincidence, but it would be nice to have a quick solution and to know the explanations for everything that has happened to lead to the filtering of so many results from Rojadirecta, from two different domains and based on two different complaints, since none of the documents published by Chilling Effects demand the filtering of everything being censored, and also keeping in mind that one of these complaints does not even demand that anything be eliminated from the search engine. According to what is being told to us by TorrentFreak (a site dedicated to news related to the world of P2P and copyrights), they asked Google for an explanation 6 days ago, but they have not received any response. Proof that Google does not show the rojadirecta.es page due to a complaint that does not request this. Proof that forum.rojadirecta.es/ is being specifically filtered (other addresses with lower SEO values do appear, such as forum.rojadirecta.es/index.php). Proof that blog.rojadirecta.es/ is being specifically filtered (-inurl eliminates results that are not from the page). We are currently trying to index http://test.rojadirecta.es/ at Google. Despite that web address has never infringed nor linked to any infringed copyrighted content, unfortunately we expect Google to filter also that result. On Saturday, we confirmed that www.rojadirecta.es was no longer appearing in Google’s search results. The company owner of the popular search engine had received a complaint related to the DMCA and, because of this, eliminated the homepage for rojadirecta.es from its search results. Google did not provide us with a copy of the complaint (or we simply did not receive it) so we decided to get in contact with Chilling Effects, who had processed the complaint that Google sent them very quickly. Once the complaint became available on the Chilling Effects web site, we discovered that it was made by the Major League Baseball. Oddly enough, the complaint was not related to Google’s search engine. In fact, it was sent to Google’s advertising program, Adsense. 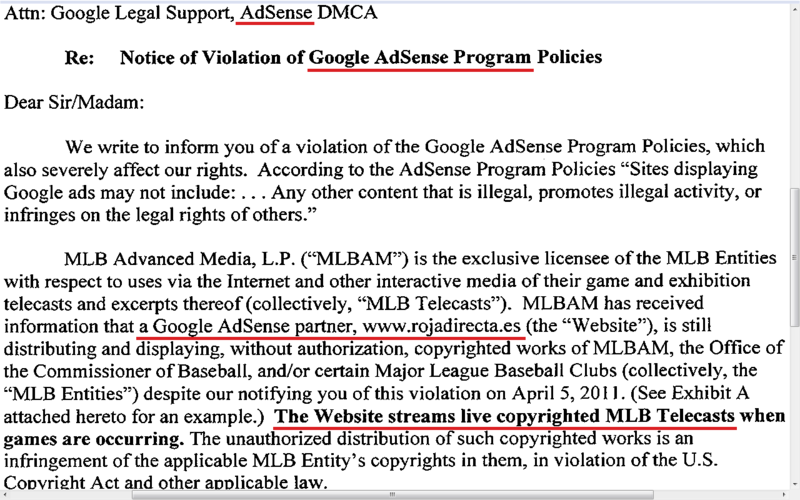 For these reasons, it seems as though Google eliminated rojadirecta.es from its search results even though this was not what MLB had requested, since their intentions were apparently to simply eliminate Rojadirecta from the Adsense advertising program. Rojadirecta does not participate in Google’s Adsense program so it is impossible to eliminate it from that program. Moreover, Rojadirecta does not even publish banners or contextual ads. Not only does Rojadirecta not transmit the aforementioned content, but it does not directly transmit any other type of audio or video content. Rojadirecta is simply an index of sporting events available on the Internet and not a provider of audio and video content. Incidentally, we believe this is not the first error of this kind made by Google that we’ve had to deal with. In 2007 our entire rojadirecta.com domain was blocked because of a complaint regarding the specific http://www.rojadirecta.com address (something which does not coincide with Google’s instructions for DMCA-related complaints in which it asks for conflicting keywords and their corresponding list of addresses). Something similar happened to The Pirate Bay in 2009 though Google was quick to correct the error. That isn’t the case here however, seeing as this domain has been completely banned for 4 years with hundreds (actually, millions) of search results deleted (e.g. site:rojadirecta.com or, site:forum.rojadirecta.com). Judging by the screenshot sent to Google by MLB, it seems likely that MLB was unaware of the concept of redirection through frames. Links to channels from Rojadirecta.es use the address: http://www.rojadirecta.es/goto/&#8230;, which means that the address bar continues to show our URL. For instance, http://rojadirecta.es/goto/google.com loads google.com, while http://www.rojadirecta.es/goto/twitter.com/rojadirecta loads our Twitter page. For this reason, the Google advertising that was seen by MLB probably appeared on some page linked from Rojadirecta. In any case, as it refers to Google, it is fair to say that we do not believe that they have acted in bad faith. 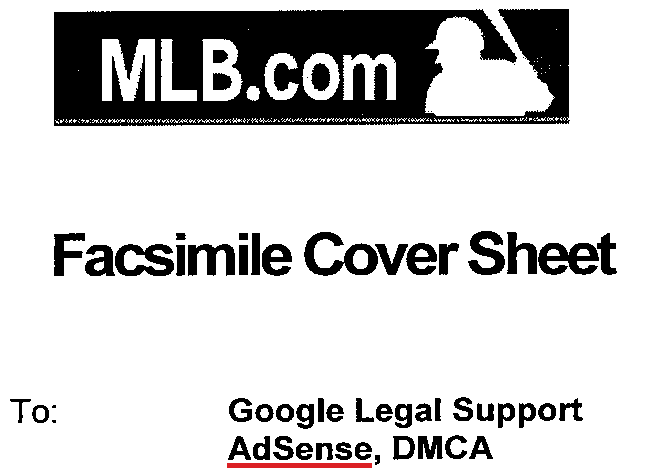 Regarding MLB, we believe that the report sent to Google Adsense was not sent in bad faith either. Apparently, they do not have anything to gain from reporting a website to an advertising program when the site does not participate in it. Thus, it would seem obvious that this was only a mistake, as long as the responsible party did not know that redirection by frames was involved. Regardless, alleging that Rojadirecta transmits such contents is a very serious matter. In fact, it is a rather serious problem that a professional whose responsibility is to protect copyright on audio and video content found on the Internet cannot distinguish between sites that host and transmit content and sites that simply index other pages or streams. Furthermore, if they were aware that Rojadirecta does not transmit content but used the complaint to force Google to act in their interests, the problem is a much more serious one indeed. Fortunately, Google’s algorithm replaced the deleted address with a Rojadirecta IP address. Therefore, it has at least always continued to appear among the first search results for “rojadirecta”. El sábado comprobábamos que la dirección www.rojadirecta.es ya no aparecía en Google. La compañía del popular buscador había recibido una queja relacionada con la DMCA y por ello había eliminado del buscador la portada de rojadirecta.es. Google no nos había remitido la queja (o al menos no la recibimos) por lo que dificilmente podíamos enviarle una reclamación contra la notificación (DMCA counter-notification). Por ello nos pusimos en contacto con Chilling Effects quien procesó muy rápido la queja que le facilitó Google. Ya con ésta disponible en el sitio de Chilling Effects descubrimos que la había enviado la Major League Baseball. Curiosamente la queja no estaba relacionada con el buscador de Google sino que lo remitieron al programa de publicidad Google Adsense. Por lo tanto parece que Google eliminó del buscador rojadirecta.es cuando eso no era lo que pedía la MLB cuya intención aparentemente era eliminar a Rojadirecta del programa de publicidad Adsense. Rojadirecta.es no participa en el programa Google Adsense por lo tanto es imposible eliminarlo del citado programa. Es más, Rojadirecta ni si quiera publica banners o anuncios contextuales. Rojadirecta no sólo no transmite los mencionados contenidos si no que directamente no emite absolutamente ningún contenido audiovisual. Rojadirecta es un índice de eventos deportivos disponibles en Internet y no una web emisora de contenidos audiovisuales. Creemos, por cierto, que no es el primer error de Google similar que sufrimos. En 2007 ya nos bloquearon todo el dominio rojadirecta.com por una queja relacionada con la dirección específica http://www.rojadirecta.com (algo que no concuerda con las indicaciones de Google para quejas relacionadas con la DMCA en las que pide las keywords conflictivas y sus correspondientes lista de direcciones). Algo parecido le sucedió a The Pirate Bay en 2009 pero Google lo corrigió en poco tiempo, no así en nuestro caso dado que ese dominio lleva unos 4 años baneado por completo con cientos (en realidad millones) de resultados de búsquedas eliminados (ejemplo site:rojadirecta.com o site:forum.rojadirecta.com). A juzgar por la captura de pantalla enviada por la MLB a Google podría ser que la MLB ignorase lo que es una redirección por frames. Los enlaces a canales desde Rojadirecta.es tienen esta dirección http://www.rojadirecta.es/goto/&#8230; de forma que en la barra de direcciones se mantiene nuestra dirección. Por ejemplo http://www.rojadirecta.es/goto/google.com carga google.com mientras que http://www.rojadirecta.es/goto/twitter.com/rojadirecta carga nuestra página de twitter. En consecuencia se puede suponer que la publicidad de Google que han visto en la MLB probablemente estaba en alguna página enlazada desde Rojadirecta. Por parte de la MLB tampoco creemos que haya mala fé en el reporte a Google Adsense. Aparentemente no gana nada reportando a una web a un programa de publicidad si la web no participa, es obvio que es un error, por lo que todo apunta a que realmente el responsable no sabía que se trataba de una redirección por frame. Referente a afirmar que Rojadirecta emite esos contenidos cualquiera de los dos supuestos es realmente grave. Que un profesional con la responsabilidad de proteger los derechos audiovisuales en Internet de una empresa no distinga quien emite y quien indexa es bastante grave. Si, en cambio, sabía que Rojadirecta no emite pero lo utilizó para que Google respondiese a sus intereses entonces es algo mucho más grave aún. Afortunadamente el algoritmo de búsqueda de Google sustituyó la dirección eliminada por una dirección IP de Rojadirecta por lo que al menos el sitio en ningún momento ha dejado de aparecer en los primeros resultados al buscar “rojadirecta”.